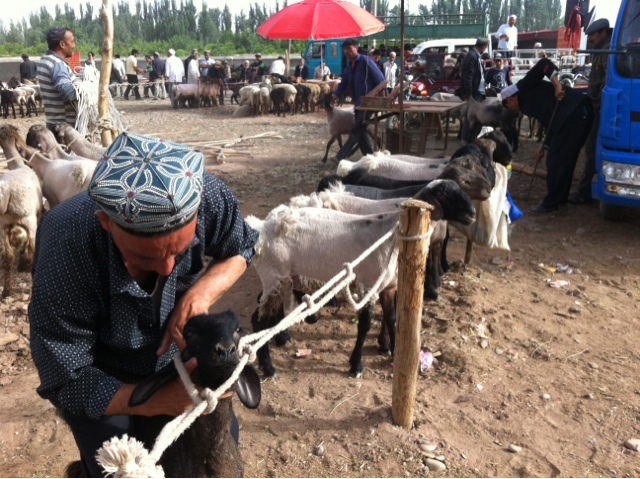 For all its sights, Kashgar is most famous for its Sunday livestock market. We took a tuck tuck ride out to the site arriving by 9:30 as the traders were setting up. Cows, sheep, goats and donkeys were being unloaded from trucks, tuck tucks and scooters. Roped in lines for inspection they were soon the centre of intense bargaining. A small cow seemed to go for 300 to 400RMB (about £30 to £40). Around the periphery stalls were selling food. It was hard to tell what the sheep thought about seeing their mates cut into bits and hung from the rafters. Horse bridles, hand made knives, ropes and all that the Kashgari livestock farmer might need was for sale. A quiet after pin sightseeing and cleaning and then a traditional Uighur dinner. Lamb pizza. Just the job.